Campéole Clairefontaine är en camping i Royan, Charente-Maritime, belägen vid havet. Campingen har platser med skugga, utan skugga och platser med lite skugga. Campéole Clairefontaine ligger i närheten av en sandstrand. Det finns möjlighet att hyra husbilar, vandrarstugor och bungalows. På campingen finns en lekplats och ett sportområde. Denna inspektör gör varje år ett besök på Campéole Clairefontaine och inspekterar campingen för ca 200 faciliteter och för andra förekommande punkter. Inspektören är en medarbetare från ACSI och arbetar inte för campingen. Quite a tricky entrance between houses up a lane. Friendly staff, especially the maintenance man ! 10 mins walk to beach and 10 mins drive to superb 1960s town. Vast beaches further up the coast. No local shops but good supermarkets in easy drive. They close the pool at 7pm for some reason despite it not being supervised anyway. Plenty of space in huge field at rear for children to play in with the biggest bouncy castle ever ! You need to trust your sat nav more than you should to find this site as it is down an unmarked driveway no sensible person would attempt towing a caravan down. Although the site had rules about dogs on leads and noise after 2300hrs there is no proactive enforcement and groups of 2 or 3 units on a single pitch was allowed with the subsequent party noise well into the small hours. Our dog was attacked several times by loose dogs. Worst thing WIFI!!! Should not have wifi logo everybody complaining, we were sent to bar to get best service but they said don't know why they send everybody there because it doesn't work!! Be careful of mosquitoes!! By the stagnant stream at back of pitches !! Great location 5 minutes walk to seafront bars, restaurants and beach. Nice pool on site. Toiltes and showers very clean and tidy. Good location to visit surrounding areas. We have been there several times and always enjoy our stay. Mercie bien !! Mein Mann hatte gleich am ersten Tag einen Achillessehnenriss beim Tennisspielen, sofort hat uns ein Mitarbeiter vom Camp in eine Klinik gefahren und war uns dort behilflich, das war sehr freundlich. Leider war dann unser Aufenthalt dadurch schnell beendet, aber das werden wir im nächsten Jahr nachholen.Der Platz ist prima , es gibt nichts zu beanstanden. A very good site within 5 min walk to beach, shops and restaurants. The reception staff were friendly and very helpful. The on site snack bar was available for pizzas and take awy food. Friendly reception. Fairly spacious pitches with plenty of trees for shade. Toilet and shower facilities quite old (the only ones open when we were there were the ones by the pool) but reasonably clean. Easy walk to the beach, approx. 10 minutes. Supermarket approx. 30 minutes walk. Convenient area to exercise our dog just outside gate. We visited the site on 22 April 2014. The entrance to the site is down a very narrow, twisty road. We didn't find the site attractive and decided not to stay, partly as they were charging extra for Wifi. There was insufficient room to turn which required us to transit the site. We were given instructions very rapidly in French and found that we could not leave by the same exit as the turn was too sharp, so ended up at the exit which was signed as 'sortie' where we found, of course, that we needed a code in order to raise the barrier. I walked back to the office and explained (in French) that we had made an error and that we were at the further exit, and asked if the woman there could please open it, or give me the code. Her reply was 'It's your fault. You should have listened to me' and shrugged her shoulders. After asking again if she would let us out, without a word to me she gestured to a workman to open it and then made a sign to me to leave. Such rudeness is inexcusable. Vill du boka campingen Campéole Clairefontaine eller få mera information? Det går bra med nedanstående uppgifter eller via campingens webbsida. 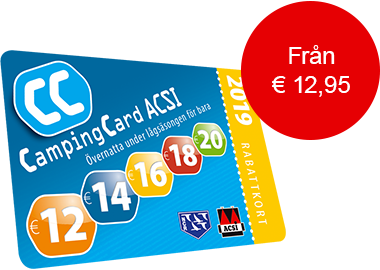 ACSI Eurocampings skickar din informationsförfrågan till "Campéole Clairefontaine".